Fortunately, dandelions do have a small and very allegiant cadre of fans here in the States. Along with traditional eaters, a new group of greenmarket enthusiasts, and those interested in foraging and wild greens are taking a shine to dandelions. And for good reason. They are delicious, and hugely healthy. Nutritionally, dandelion greens and roots are chock full of vitamins, minerals and antioxidants. They are one of the most nutritionally dense greens you can eat. Along with the punch of nutrition, they have many medicinal qualities as well. They are potassium-rich and have a strong diuretic quality, as well as efficacy as a blood detoxifier and good for the liver. They have long been used to treat digestive disorders and to treat arthritis and eczema. Young dandelion greens are tender and delicious served raw in salads or sandwiches. If you use the greens that have been harvested after the plant has flowered, you can blanch them in water to remove the bitterness; dump the bitter water, and blanch them again. You will loose a lot of vitamins this way, but there are still plenty of beneficial nutrients left. Use sauteed or steamed dandelion greens as you would any other greens. 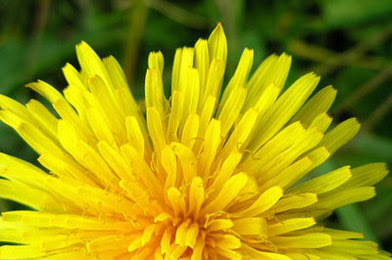 Dandelion root can by ground and used as a substitute for coffee, and dandelion flowers can be used in recipes and for garnish. The French have a well-known soup called creme de pissenlits (cream of dandelion soup), which is easy to make, as is Dandelion Syrup. 1. If using more mature or very bitter tasting greens, blanch them in a pot of boiling salted water, then drain and squeeze out the excess water, chop and set aside. 2. Heat butter or oil in a large pot over medium high heat, add greens, carrot and leeks and cook, stirring often, for 15 minutes. 3. Add stock and simmer for about 15 minutes. Reduce heat to medium and whisk in milk, cook stirring frequently, until slightly thickened. 4. Puree mix in a tightly-covered blender until smooth, taking care with the hot liquid. Season with salt and pepper, and add Dijon if you like. 5. Serve in bowls and garnish with flowers or buds. 1. Remove the petals from the sepal (the sepal consists of the small tight leaves that extend from the stem and grasp the flower). This takes a while to get the hang of, but gets much quicker as you go along. Be sure to not allow any green into the petals, it will add bitterness to the syrup. 2. Place the petals in a medium pot and cover with 3 cups water and bring to a simmer. Turn off the heat, cover and let sit overnight. 3. Strain dandelion water into a bowl, pressing on the flowers with the back of a spoon to extract all the liquid. 4. Return water to pot and add sweetener, and lemon juice if using, and simmer over low heat until thickened. 5. Allow to cool, and pour into a clean jar or bottle. Store covered in refrigerator. Great for your Survival Victory Garden!